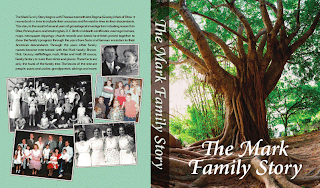 Many people are intimidated by the thought of family reunions. They visualized scores of people and a logistical tangle. You can however, think small and have a successful gathering with plenty of time to talk, share and enjoy each other. This weekend was our annual connection with our Coyle Cousins. In 2008 we met for a long afternoon in Waterbury, Connecticut, the home of our mutual ancestors, Patrick & Margaret (Brady) Coyle. We talked for hours in an Olive Garden and realized we needed more time to connect. In 2009 we spent a weekend at Pat’s waterfront home in New Jersey. Besides comparing family trees we enjoyed the water, shopped for antiques and discovered many things we have in common (like freckles!). In 2010 the cousins came to my house in New York State. We expanded from Pat Brady, Tara (Herbert) Cousins and myself to include a newly found cousin, Lisabeth Timothy and her family. A BBQ and a boat ride on the Hudson River were fun components of the weekend. This year we were in Massachusetts at Tara’s & Ashley’s marvelous house. We had a beautiful Saturday for our visit to the Minuteman National Historic Park in Concord and a stop at a farm stand for the best corn on the cob ever. Despite all the pampering by Tara & Ashley the best part of the weekend was meeting even more family members! Lisabeth brought along her delightful parents, Charles & Lucille (Coyle) Timothy. Lucille greeted me by reaching out and touching my face and saying, "I know that face. You are a Coyle!" Lucille brought along photos & stories to share. A surprise guest was Tara’s sister, Marcia Cass Herbert, who came over from Cape Cod to meet more family. We took a tip from old photos we were looking at and gathered on a set of steps for a fun photo. Home again, I am anxious to analyze all the new family information I now have. I look forward to next year’s gathering! Maybe we can discover more cousins to join us then. 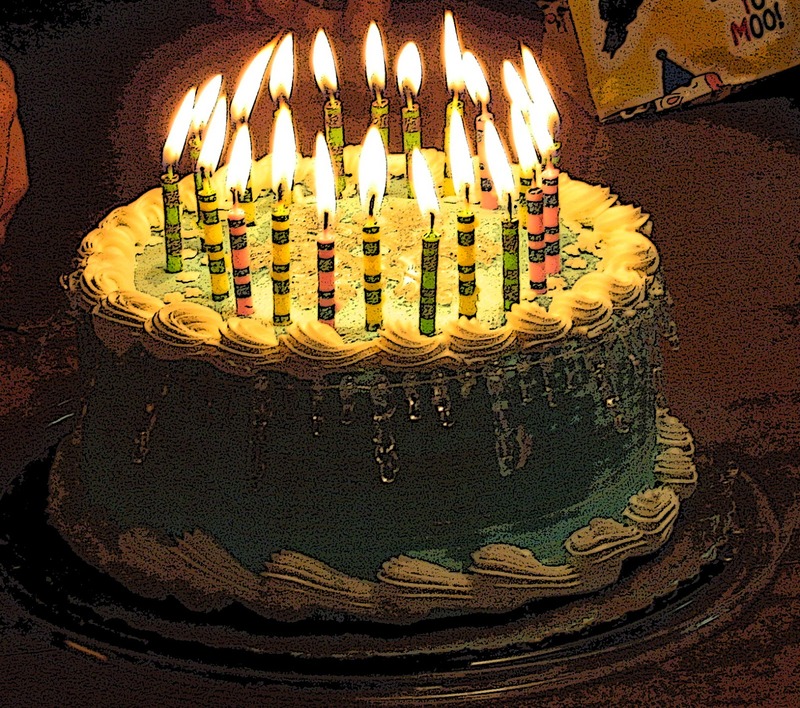 1933 Howard Merton HURD JR was born in Michigan, the son of Howard Merton & Marian Louise (Lehman) Hurd. In 1955 he married Fern Marie Atkins. They had three children. 17 September 1825 Annette ROMICH married Daniel Ritter, son of Henry & Lydia (Knappenberger) Ritter. Annette & Daniel had seven children: William, Rebecca, Montana, Peter, James, Alfred, & Milton. 1911 Lillian Agnes COYLE was born in New York City, the daughter of Michael & Mary Josephine (Mullane) Coyle. Her mother died when she was 16. 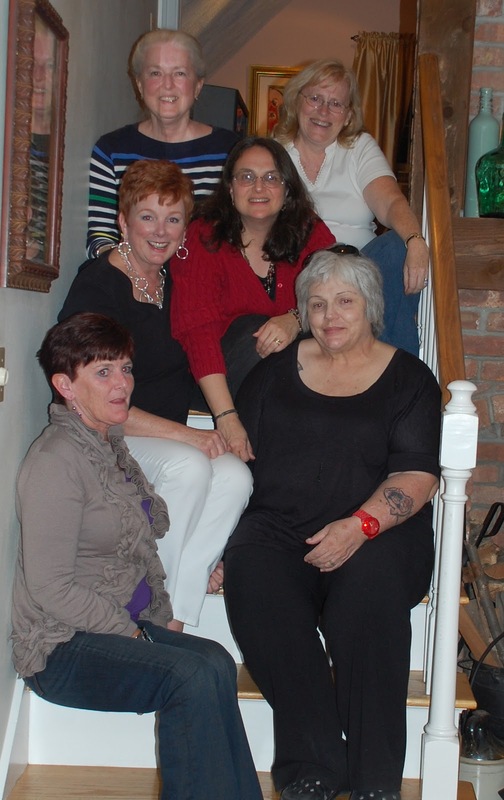 Older sister, Marguerite Coyle raised Lillian and their younger sister, Kathleen. Lillian never married. She lived her life with her sisters. She died in 1987 in Arizona. 19 September 1909 Ray Luther FORTENBERRY married Zelda Marie Alford in 1932. They had three children. Ray died in 1989. 1893 William F. CASS married Maryanne Coyle, daughter of Patrick & Margaret (Brady) Coyle. 21 September 1921 Anna J. DAMUCH married John Leo Brady, son of Bartholomew Anthony & Mary Agnes (Reddan) Brady. 1902 Golda Mae WARNER was born in Ohio. 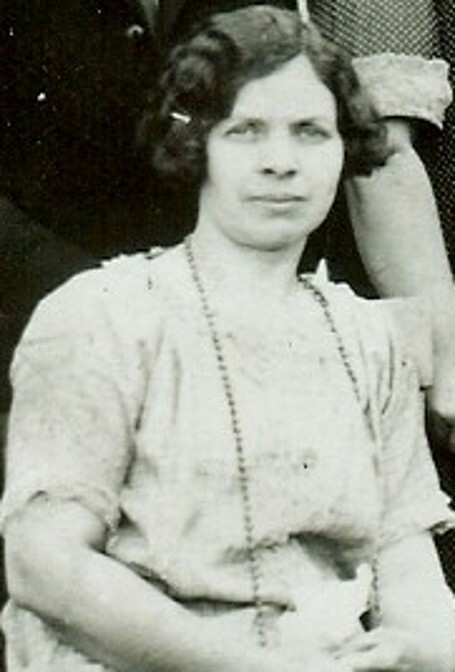 She married Eslie Guy Mark in 1922. He was the son of William & Elidia Rebecca (Ritter) Mark. Their children: Guy, Glenn & Dana. She died in 1982. 23 September 1885 John Charles RITTER was born in Ohio, son of John William & Ruth Anna (Scott) Ritter. He married Jennie Madora Hartsel. Their son: Donavan Eugene Ritter. 24 September 1828 Lacey ALFORD was born in Mississippi, daughter of Edwin Barksdale & Martha P. (Smith) Alford. She married James Michael Ball. 1885 Martha Elizabeth ALFORD was born in Mississippi, daughter of Needham Edwin & Mary Luzina (Stafford) Alford. She married Robert Thomas Hollingsworth. She died in 1966. 1894 Ralph Ely MOORE Sr. was born in Ohio, son of Peter Jonathan & Caroline Louise (Gruissy) Moore. He married Dorothy Otella Derhammer. Their children: Howard, Joyce & Ralph. He died in 1976 in Oklahoma. 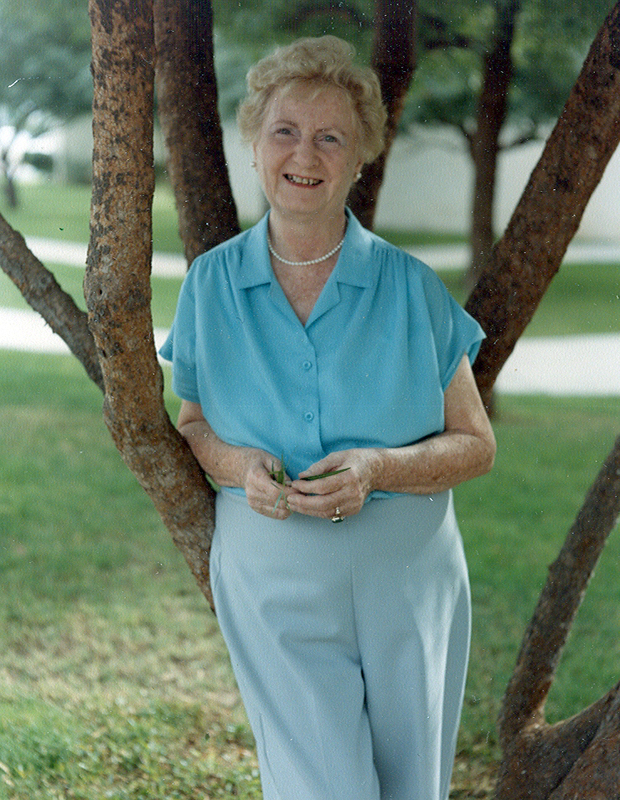 28 September 1914 Rosemary Veronica COYLE was born in Texas, daughter of James Joseph & Madeline (Herbst) Coyle. She married Richard F. Wolff in 1939 in Connecticut. 1892 Mildred Mae WOLF was born in Ohio, daughter of Joseph & Anna Eliza (Kohr) Wolf. She married Urban Robert Zengler. Their children: Dorothy, Donald & William. She died in 1972 in Ohio. This photo was taken in the mid 1930s. 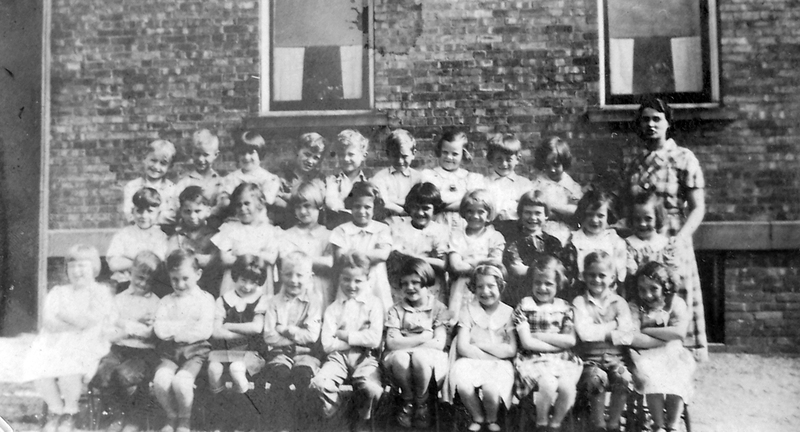 Delbert Keith Brown, my father is on the far left in the back row. He was the oldest of seven children of Roy Jesse and Ivy Regina (Mark) Brown. The family moved often and my father had to change schools frequently. Because of that, he was never a strong student. He was, however, skilled in repairing engines. I think his little smiling face is adorable. 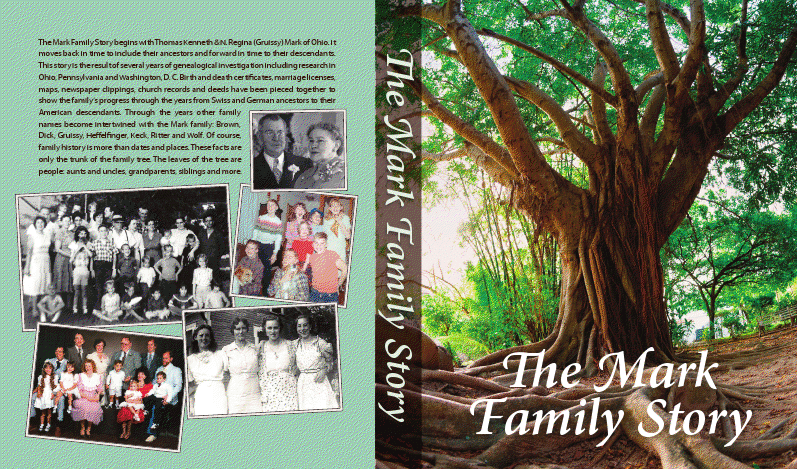 One Year Ago I began this blog about my genealogy research and my family’s history. I was happy to find a place where I could reach out to others: ‘old’ family connections who are interested in results of my research and new family connections for expanding our family information. My first blog, Pennsylvania Research for the Mark family, centered on the discoveries I had recently made. I was unsure how to add photos yet and my page set up was quite simple but I was excited about improving and expanding my blog. 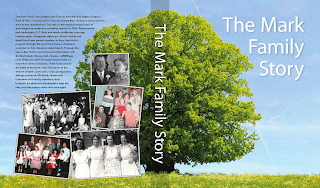 Since then I’ve added pages for family branches and links to other genealogy blogs. I was surprised to be ‘interviewed’ by Geneabloggers for their “May I Introduce You to” section in April and to be given the One Lovely Blog Award. My hopes for the future of my blog include connecting with more cousins & solving more family mysteries. I hope I have helped others by sharing the information I have gathered over the years. Thank you to everyone who has visited my blog, commented on the blog or contacted me through my blog! 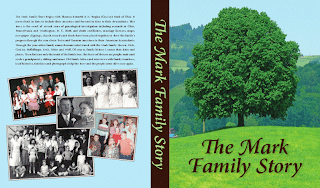 The Mark Family Story has been progressing despite formatting difficulties. Thanks to Adam the 'ghost page' is gone. This seemingly invisible page kept throwing off the page count and putting odd numbered pages on the left side. I struggled with this for ages and he fixed it in just minutes. Thanks to Alyssa and Jeff for helping me understand how to make my sidebars bleed off the page (among other things!). The next step is to select a book cover. Melissa has given me three possible book covers. Elements from each may be mixed and matched. Two elements I want to keep are a large 'family' tree and a few family photos. I may change which photos are used. Help. I am looking for your opinion. Please leave a comment and let me know which one you like best. After the cover is selected one book will be printed which I will proof read. When each word is in place, copies will be printed. Watch my blog for that big day! 1 September 1863 Emma WOLF was born in Ohio, daughter of John Franklin and Caroline (Orwig) Wolf. She married C. Prentice Waldo. Their children: Lydia, Winfred, Waylan & Blake. 4 September 1717 Julius ALFORD was born in Virginia, son of James Alford. He married Lucy Newton. They had seven children. He died in 1771 in North Carolina. 5 September 1830 Eliza Jane ELLZEY was born in Mississippi, daughter of John & Elizabeth Ellzey. In 1850 she married Burrell Taylor Fortenberry. Their children: John, William, Henry, Benjamin & Luke. She died in 1899. 6 September 1861 Edwin MARK was born in Ohio, the 8th son of Abraham & Mary Isabella (Heffelfinger) Mark. He repaired shoes at the Miller Shoe Store. He died in 1920. 7 September 1872 John Andrew GRUISSY lived his short life in Ohio. He was the only son of Augustus Ceaser & Esther Barbara (Wolf) Gruissy. He died in 1878. He may have died from diphtheria. 1896 Maud Mavis FORTENBERRY was one of twelve children of Joseph Gazie & Corine (McDaniel) Fortenberry. 1804 Frederick WOLF was youngest of nine children of John Franklin & Elisabeth (Burkholder) Wolf. 1915 Caroline Veda BROPHY was born in Ohio, daughter of William Clarence & Frances Gertrude (Moore) Brophy. She married Tom Rodgers. They had two children. 11 September 1812 Stephen BALLIET was born in Pennsylvania, the son of Joseph & Susan (Green) Balliet. In 1836 he married Ann Lowrey. Their son was Albert Harrison Belliet. 1888 Emily Augusta MORRISON was born in Ohio, daughter of Seth Benner & Margaret Jane (Gruissy) Morrison. In 1904 she married Frank Peters. Their children were Margaret & Seth. 13 September 1831 Emmaline SMITH was born in Mississippi. She was my 2nd great – grandmother in my father’s family tree.She was the daughter of Wyatt & Euseba (Fortenberry) Smith. In 1858 she married Allen Moses Brown. Their children: Mary, Jasper Pascal & Alvira. Allen probably died soon after Alvira’s birth. 1877 George A. MORRIS married Mary Louise Fortenberry, daughter of Thomas Benton & Gabriella (Sanders) Fortenberry. They had seven children: Willie, Boyce, Theodore Roosevelt, Delphin, George, Lank & Pershing Hoover. George died in 1943. 15 September 1858 Rebecca Eleanor RITTER was born in Pennsylvania, the second of seven children of Daniel & Annette (Romich) Ritter.